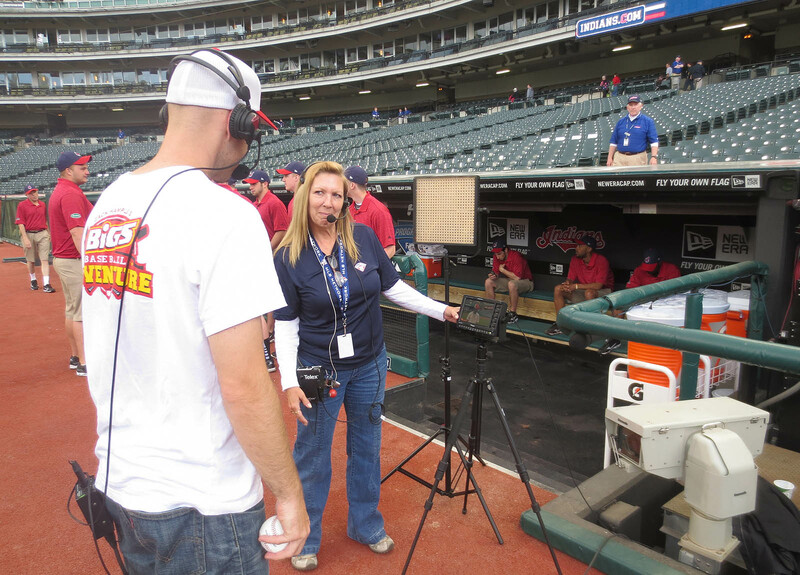 My day at Progressive Field was supposed to start with two local TV interviews outside Gate A. Forty-five minutes before the first one, while I was rushing through lunch at a nearby sports bar, I got a call from the woman who produced both shows. “What news?” I asked with a sinking feeling in my gut. 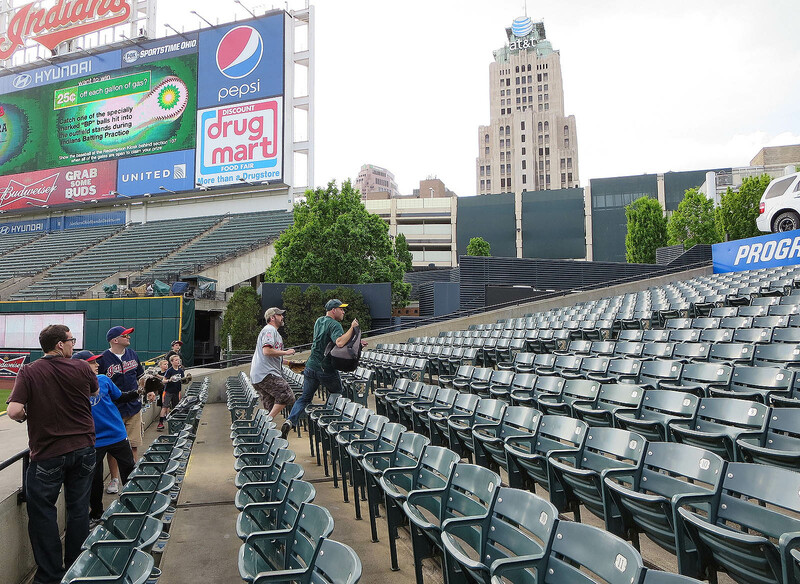 Anyway, one nice thing about Progressive Field is that it opens two and a half hours early; the not-so-nice thing about it is that everyone has to stay in right field for the first 90 minutes. 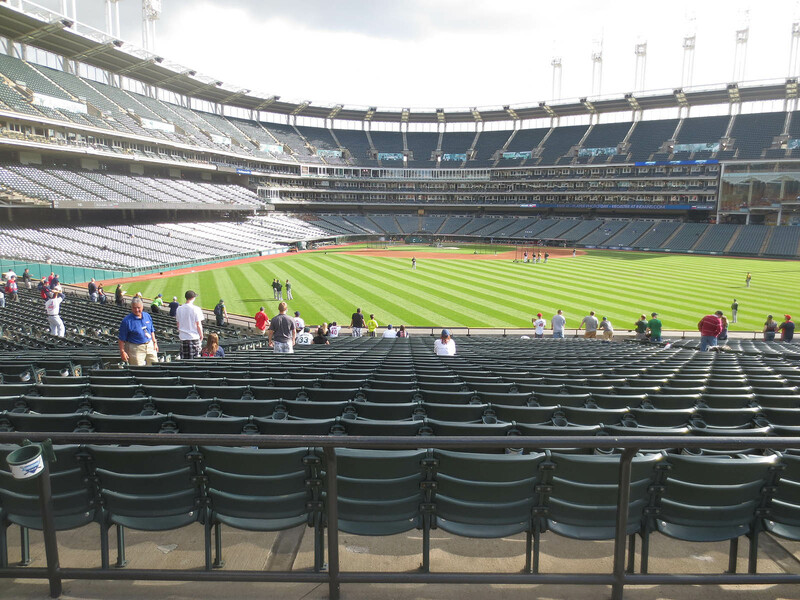 Thankfully, though, the stands out there are expansive, and because it wasn’t terribly crowded, I was able to take advantage. My 1st ball of the day . 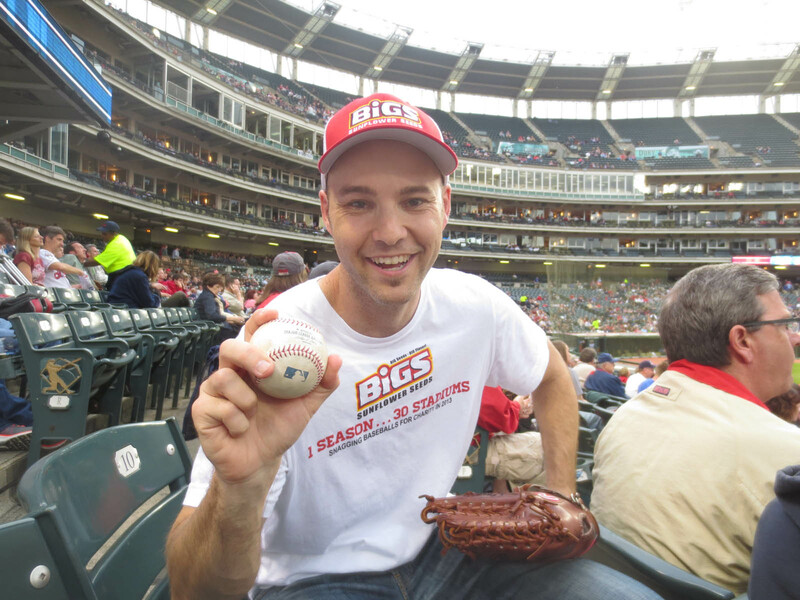 . .
Neal Stewart from BIGS Sunflower Seeds was at the stadium with me, but neglected to photograph my throwing session. 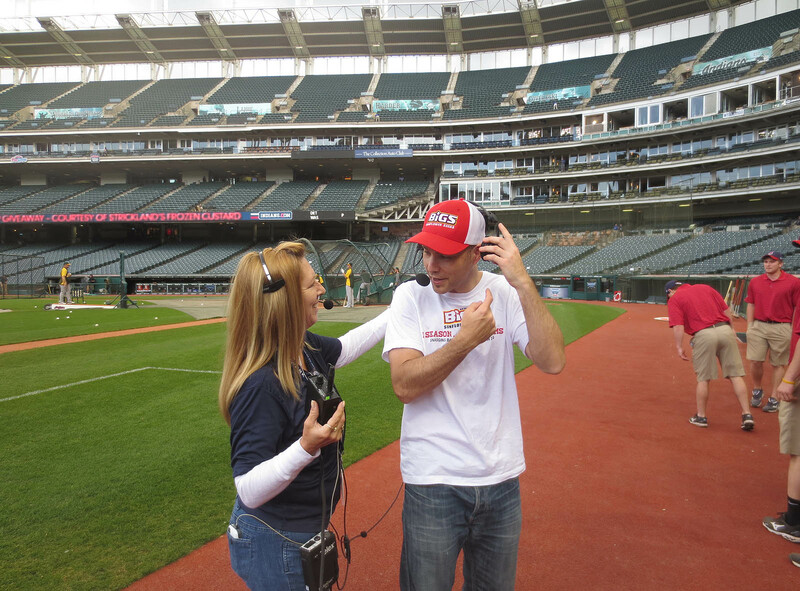 That’s because he was on the phone, going over some last-minute details for my 6pm interview with the MLB Network. As it turned out, he didn’t realize that the glove belonged to me; he assumed it had been sitting on the bullpen mound and that my string simply had a hook on the end. 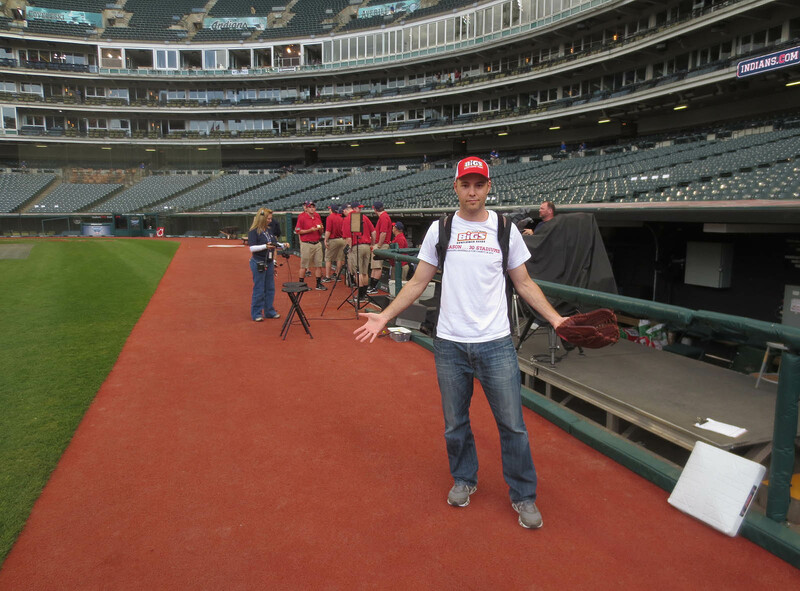 I explained that the glove was mine and that I was simply trying to snag a baseball. He shrugged and said, “I guess so.” Then he stood next to me and watched what I was doing. The ball itself, in my opinion, was mud-rubbed to perfection, but the usher didn’t see it that way. 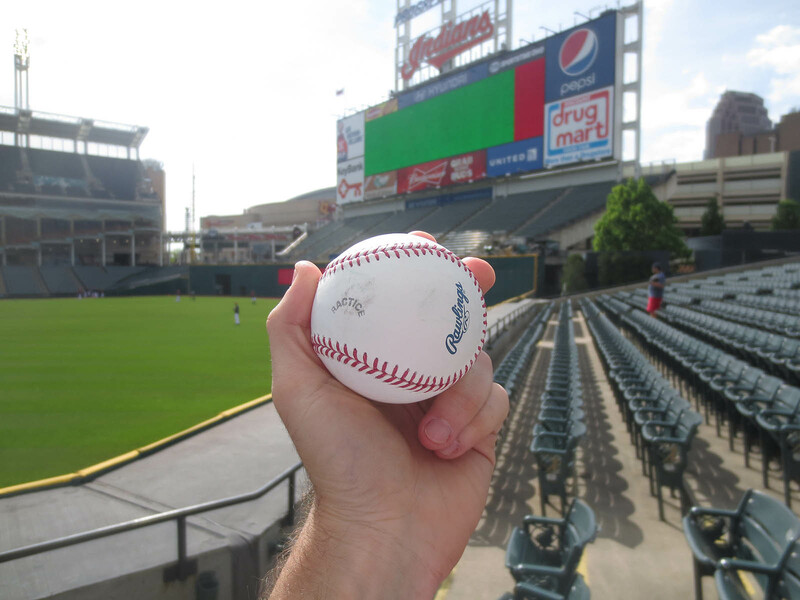 “That’s not much of a ball,” he remarked when I pulled it from my glove. I don’t know why I did that. It would’ve been easier to just keep heading through the second row and then turn right at the stairs. Maybe I assumed that the people in the front row would climb back into my row? As you can see in the photo above, they hadn’t yet moved. Here I am running up the stairs . . . In the photo above, that’s Rick on the right. 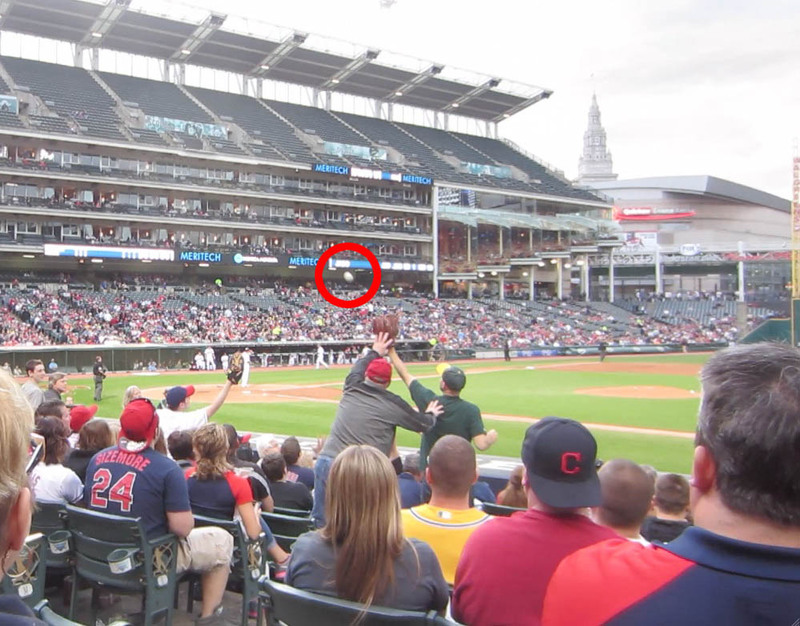 He had snagged 10 balls the day before, and he ended up with seven at this game, so don’t feel bad for him. My 7th ball was as cheap and flukey as it gets, but nevertheless, it counts. 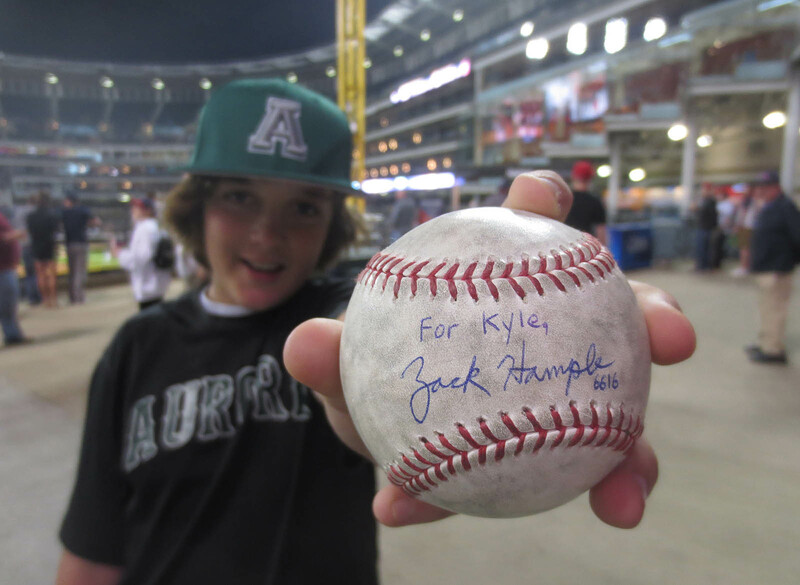 Basically, it was tossed to a little kid in the front row by A’s pitching coach Curt Young. 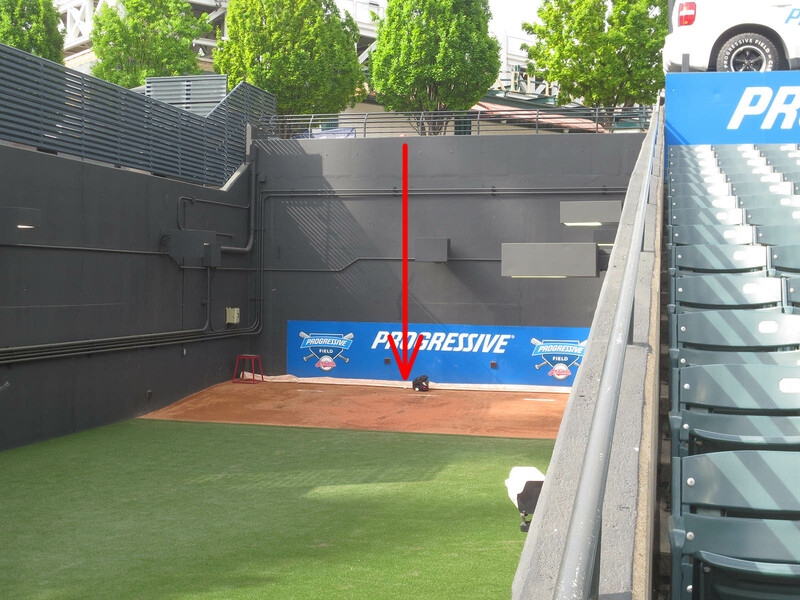 The kid dropped it, and it trickled to the far edge of the platform that separates the outfield wall from the stands. The kid couldn’t reach it, so I leaned out and gloved it and handed it to him. 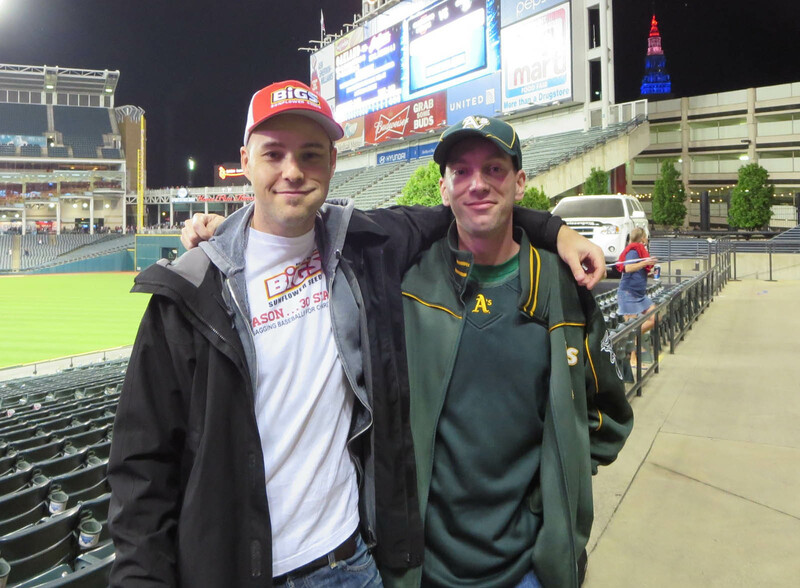 My 8th ball was thrown by Michael Taylor, my 9th ball was a Josh Reddick homer that I grabbed in the seats, and my 10th ball was tossed by Evan Scribner (thanks to Rick, who doesn’t go for toss-ups and identified him for me). Now, do you remember what time I said my MLB Network interview was scheduled for? That’s right: 6pm. 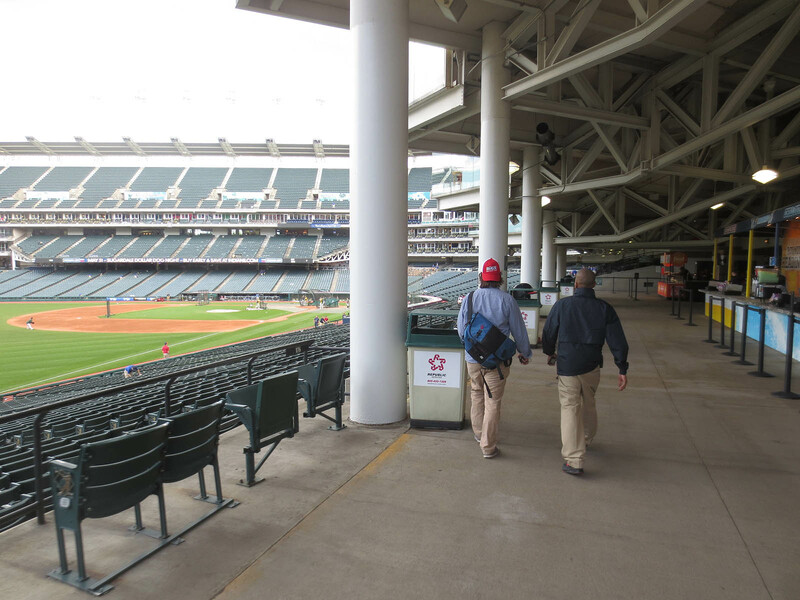 Do you know when batting practice typically ends before a night game? Yep, usually around 6:20pm. Do the math. NOT GOOD. But what was I supposed to do? NOT do the interview? 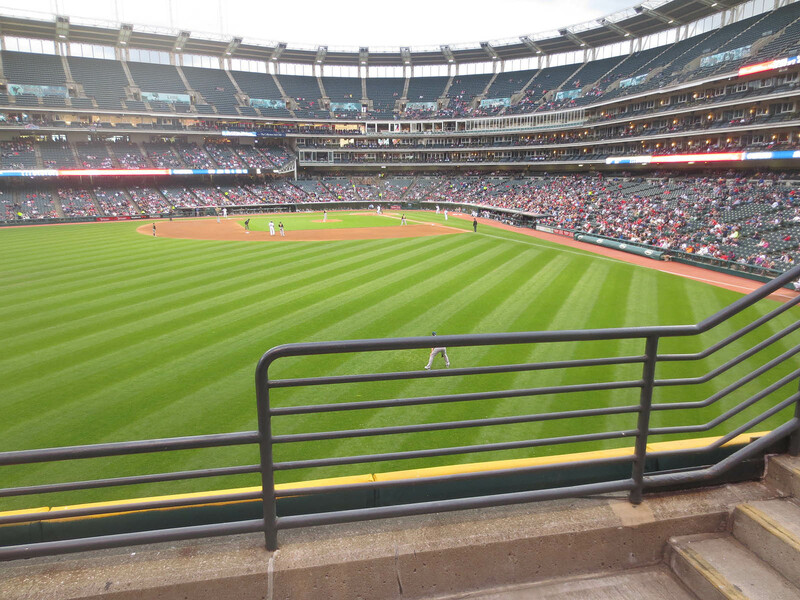 Obviously I was gonna do it, so at around 5:55pm, I made my way to the very back of the right field seats . . . 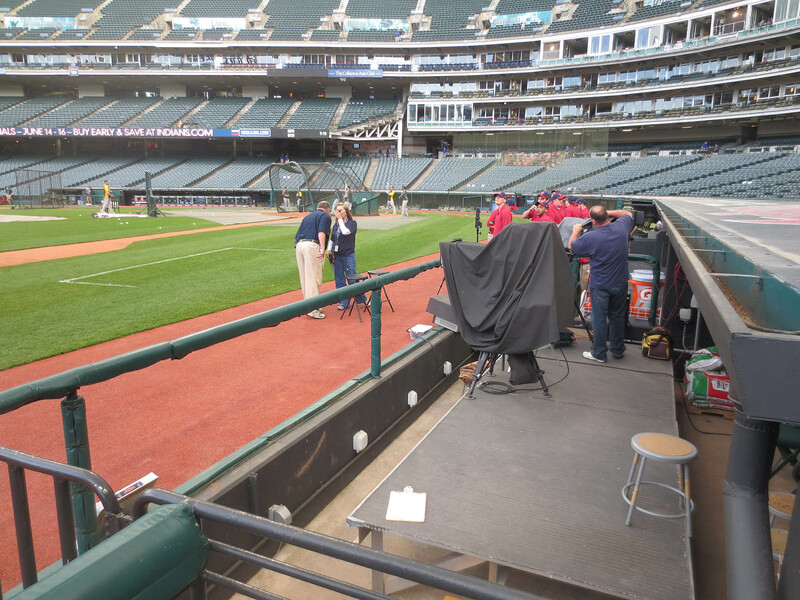 I followed Neal and the guard into foul territory . . .
Did you notice BP taking place in the background? 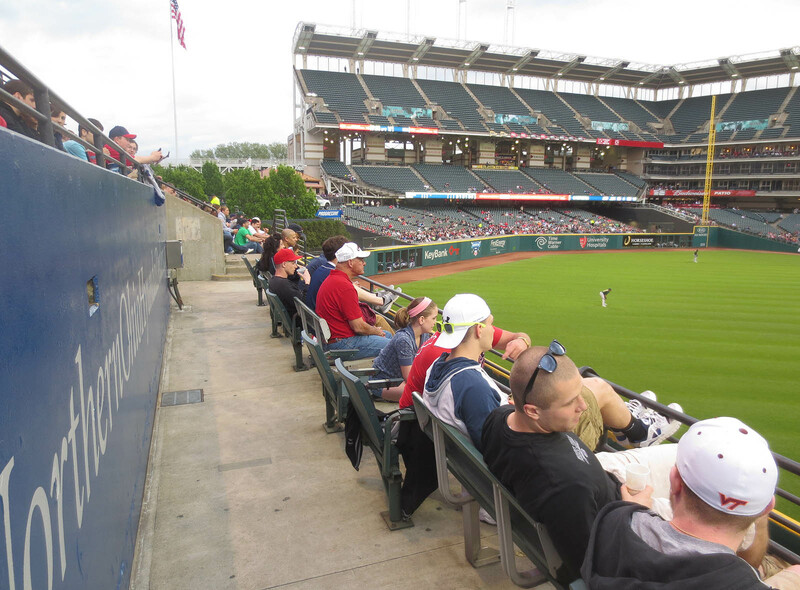 It pained me not to be in the bleachers, but I tried not to think about it. Finally, after ten minutes of setup and prep, my interview began. Unfortunately it wasn’t live. 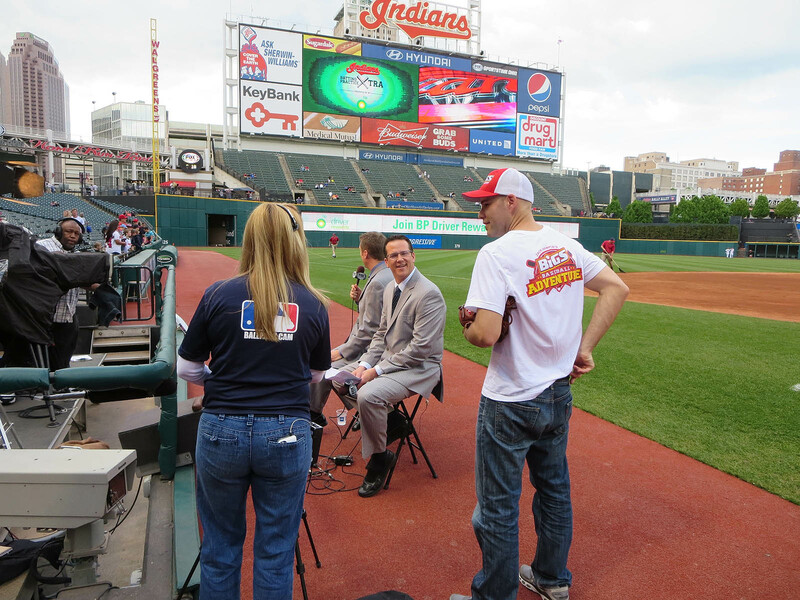 It was taped for the show “Intentional Talk,” which meant that anything I said could (and probably would) be edited. I’d been hoping that Kevin Millar would conduct the interview — I was prepared to joke about his home run off Mike Mussina that I caught on 7/28/08 at Yankee Stadium — but instead I was interviewed by some random guy in the studio in Secaucus, New Jersey. I was told to include his questions in my answers because the whole segment was going to feature my words combined with MLB’s video footage. 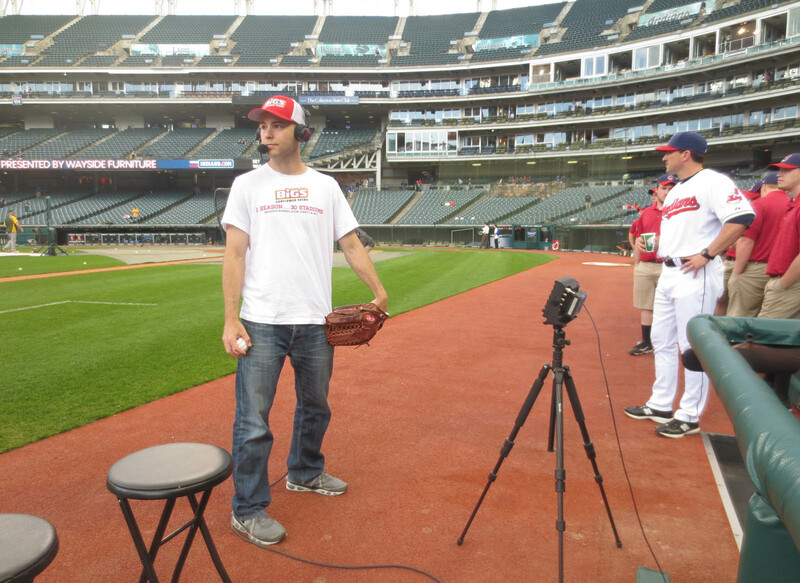 I’m not sure when this segment will air, but I’ll post an update on Twitter (@zack_hample) when I hear anything. In the photo above, did you notice that BP had ended? 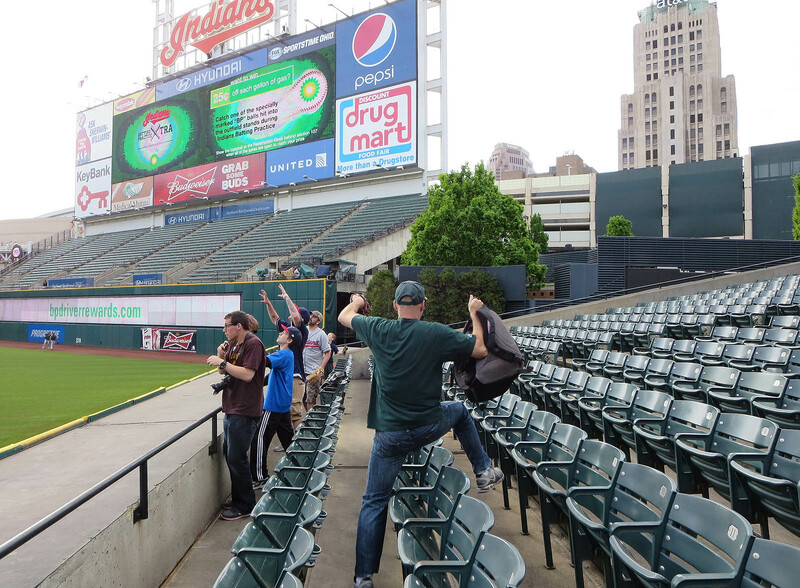 I’d been hoping to get back out to the bleachers and snag a few more home run balls. I mentioned BIGS Sunflower Seeds twice. 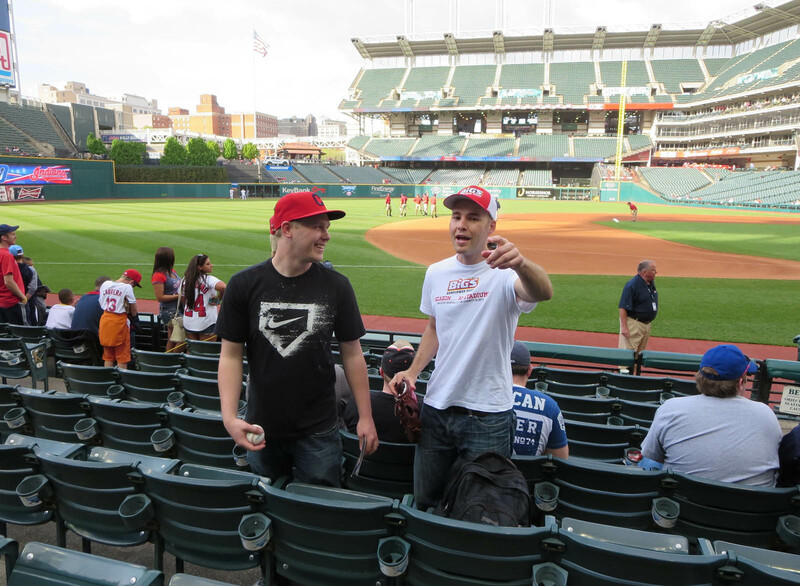 Hopefully that’ll make the cut (I predict it won’t), but at least the logos were visible on my hat and shirt. Helping to promote BIGS this season hasn’t been a burden. I’ve enjoyed helping promote them. They’re doing so much for me and for Pitch In For Baseball that I want them to get as much publicity as possible. Here I am just after the interview ended . 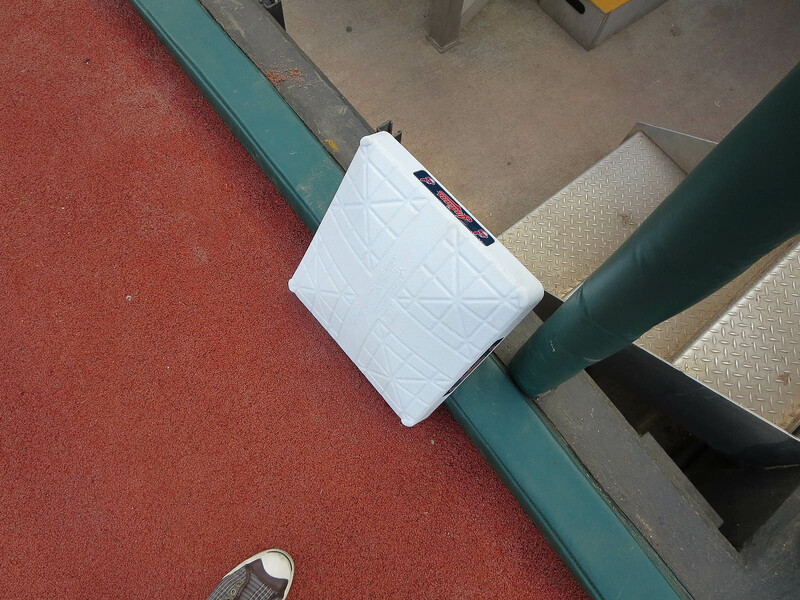 . .
Neal took a photo of the base that was sitting on the edge of the warning track . . .
. . . and that was it. I hope the interview turns out okay. The thought of the entire thing being my voice seems awkward, no? Tom has only been ballhawking for a couple of seasons, but he’s snagged about 500 balls. 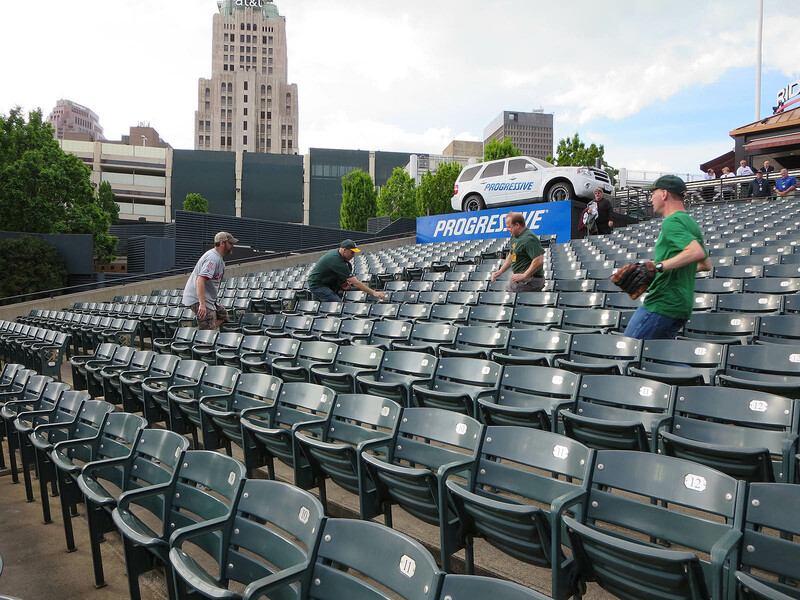 I spent the first few innings going for foul balls here . . .
. . . along with 3rd-out balls behind the Athletics’ dugout on the 1st base side. 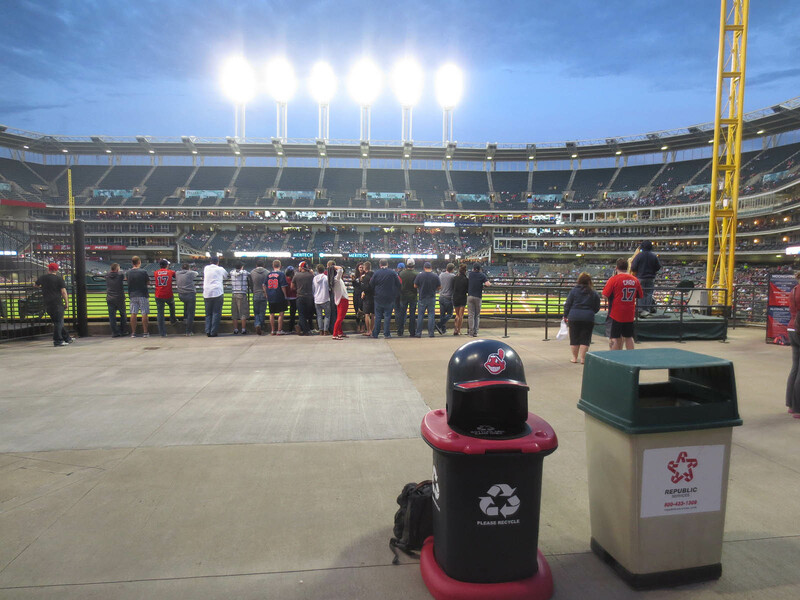 I really wanted to go for home runs, but first I had to try to fulfill the charity challenge — $500 for Pitch In For Baseball for every stadium this season at which I snag a game-used ball. 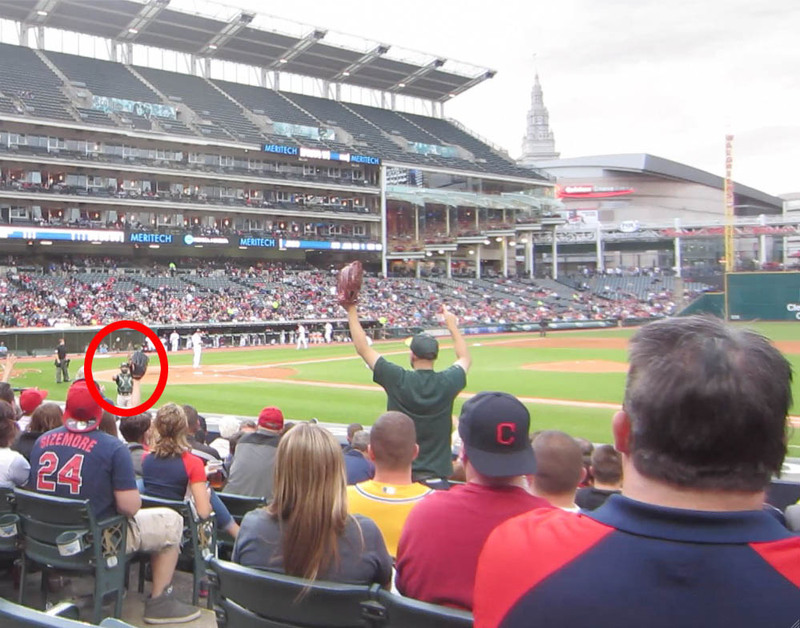 As I reached up for the ball (which was clearly intended for me), the fan in the red cap tried to push me and my glove out of the way. I spent the rest of the game in the outfield. This was my view from left field . . . Moments after I took that photo, a police officer approached me. “Is that your backpack?” he asked. 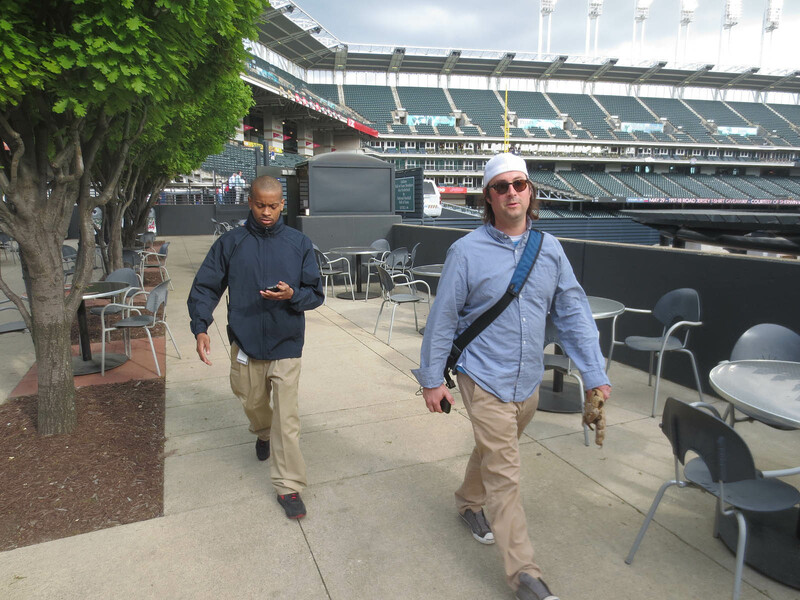 I also met a guy named Bob, who works in the press box at Progressive Field as an attendant. He’s been reading my blog for a while, so when he spotted me on the Home Run Porch, he came over and introduced himself. I didn’t snag any more baseballs for the rest of the night. That’s what happens when you’re chasing home runs and the final score is 1-0. 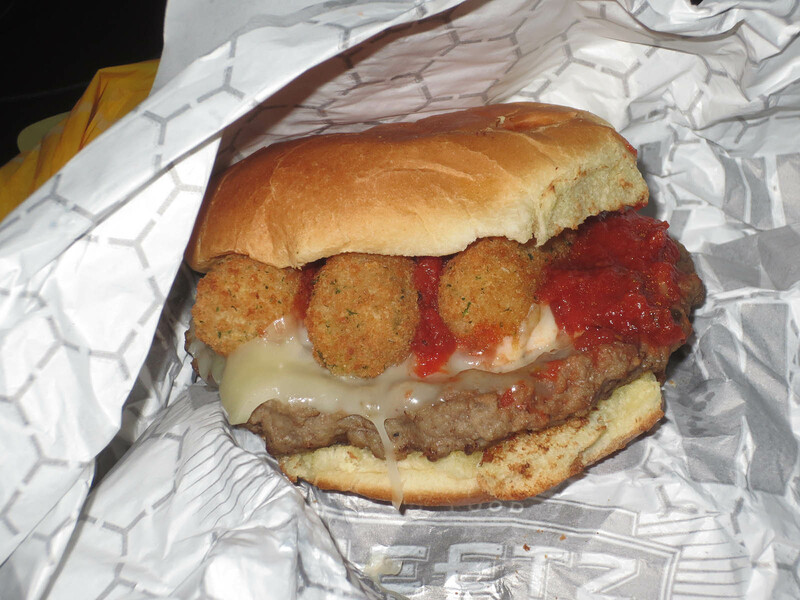 That’s a cheeseburger with mozzarella sticks. Oish. • 157 balls in 20 games this season = 7.85 balls per game. 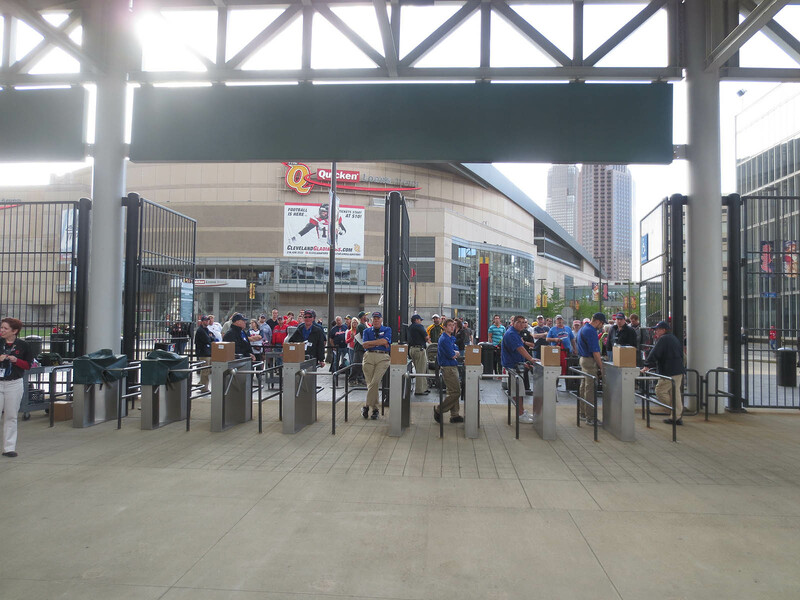 • 68 balls in 7 lifetime games at Progressive Field = 9.7 balls per game. 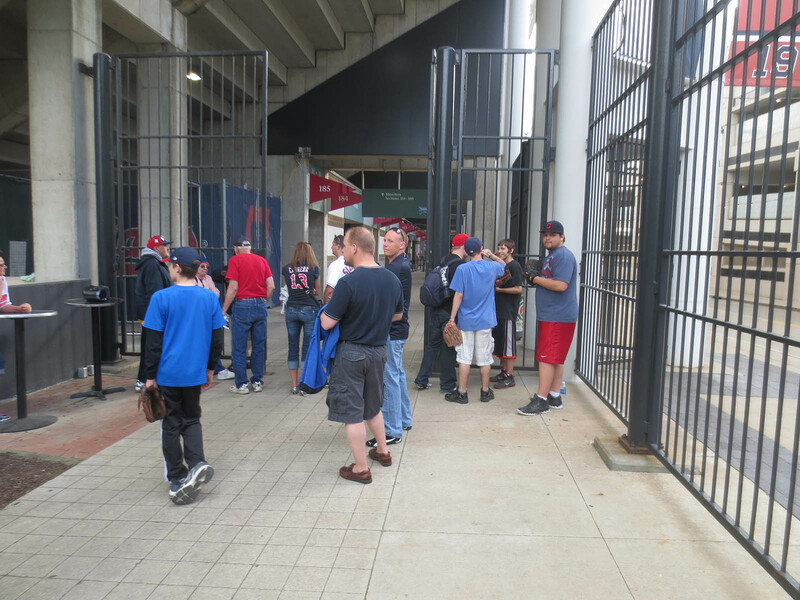 Hey Zack, Great getting to meet you yesterday at Camden…I was the kid who Neal took a picture of and posted on twitter. 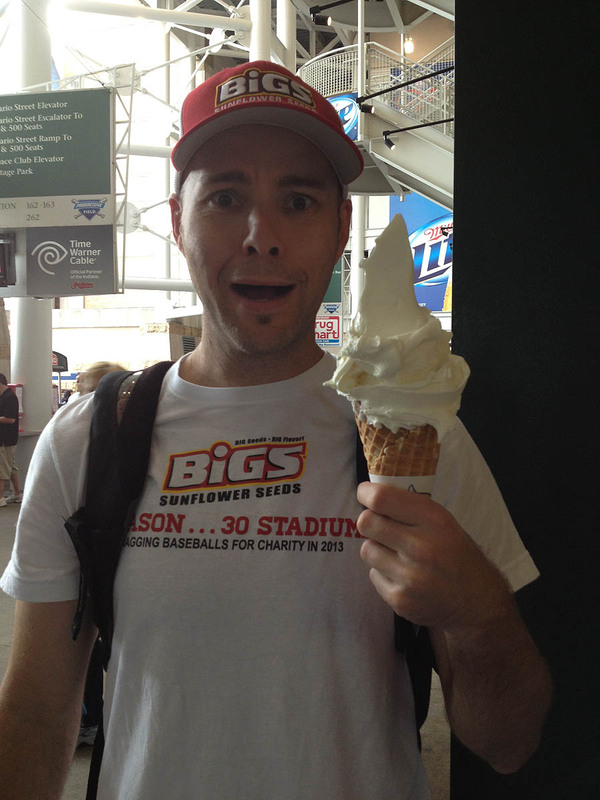 How much weight have you added with the Ballpark Diet ? The food looks disgustingly tempting but how good is it nutritionally ? The worms must be well fed. Wait wait wait. 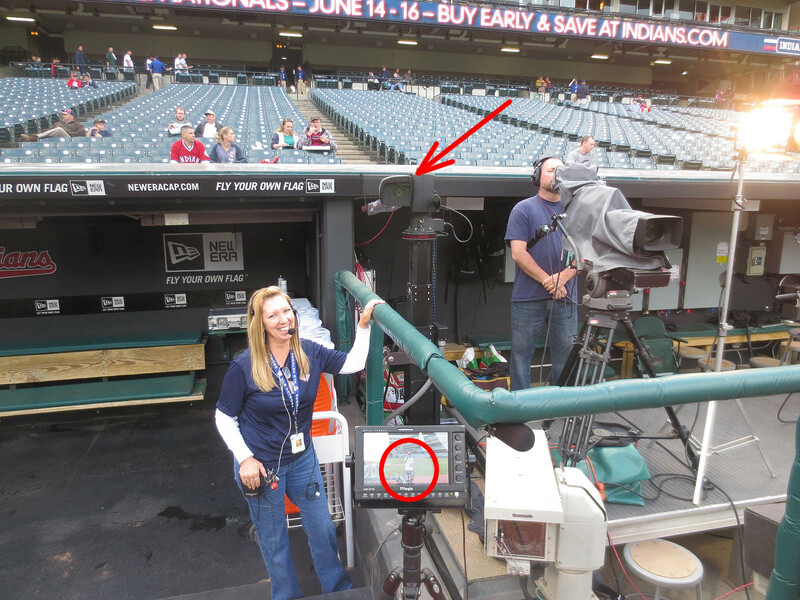 You’d rather be in the bleachers snagging 4-5 more baseballs than be interviewed on MLB network?!? 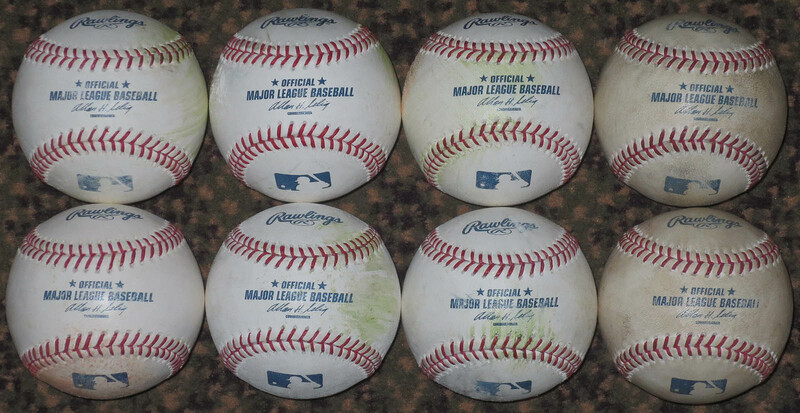 Also, did you get any balls stamped with the “BP gas” logo? I read that each ball is worth 25c/gal off gas. Obviously, I know you wouldn’t trade away the baseballs for that but I would be interested to know if they let you keep them. 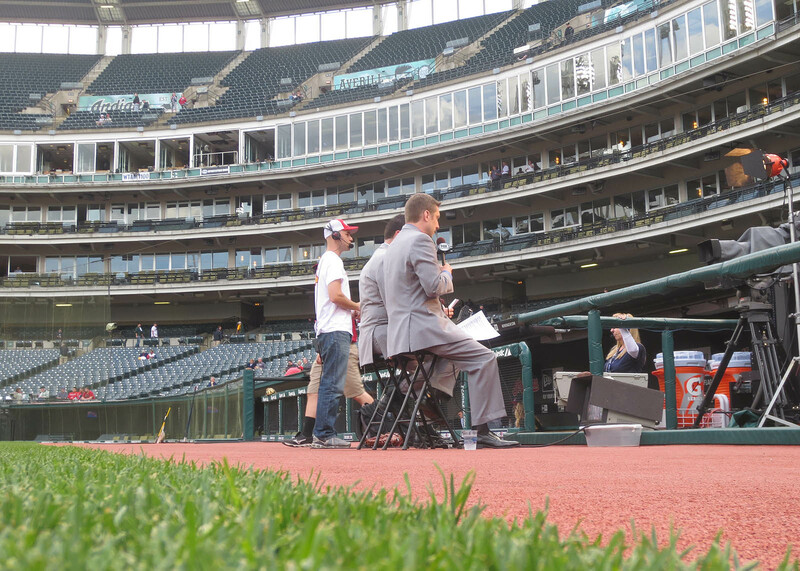 If you were wondering who is the Indians guy in the picture of you looking at the bleachers before the interview, I’m 90% positive it’s pitching coach Mickey Callaway. 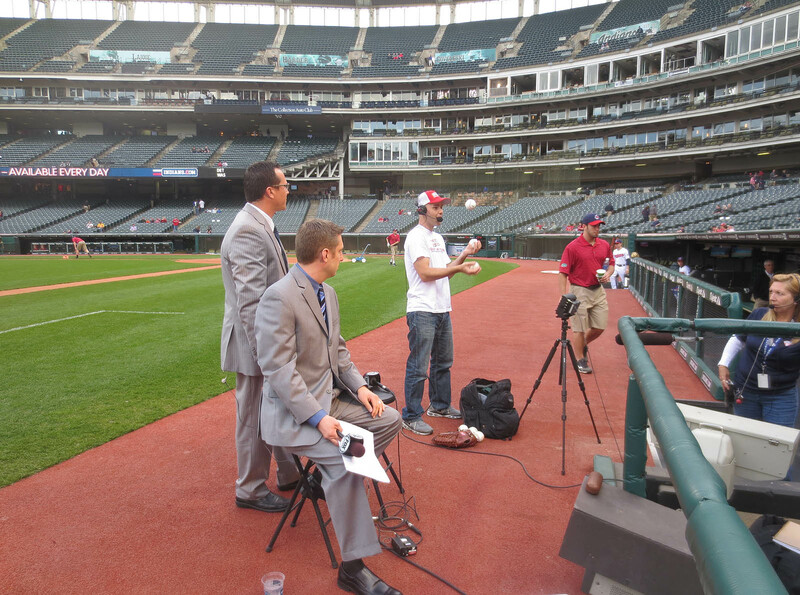 That one Indians broadcaster looks completely confused in one of the photos like “Who the hell is this guy? ?” ….. I guess they just don’t know who Zack Hample is!! By the way between the 2 of us we need just under 400 balls now for 10,000 total. Good to see you again; see you somewhere. Great meeting you too. Stay tuned for the blog entry. I plan to post it tomorrow night (after I post my PNC entry tonight). Not much. The answer to your question will appear in my next entry. I really hate missing *any* of batting practice. I can’t help it. That’s just how I am. As for the BP stamps, no, but I got some in 2011 when I was there. Thanks. I think you’re right. I vaguely recall seeing his name on the back of his jersey. It’d be cool to reach 10,000 at the same place, but that might be difficult to plan. Let’s see how things play out over the next month or so . . .
Good seeing you too (and meeting Phil). Sheetz? Hmm. I never even noticed the name. Neal just pulled in there and told me it was good. I was delirious at that point and would’ve eaten just about anything. Hey man, good job not letting that creep keep you from catching that ball. What was up with the guy anyway. I was at PNC a few days before you were, left field is nice. I have a few tricks to getting in early which I recently learned. Keep on grinding man. On the field! Look at you! How did you get that catchers attention? And very good entry!! Thanks. I don’t know what his deal was. You like left field at PNC? I don’t. It’s too deep, and the rows are too long and get crowded quickly. Easy: I waved my arms and shouted his name. Did you get to meet with guy that bangs the Indian drum in the bleachers? 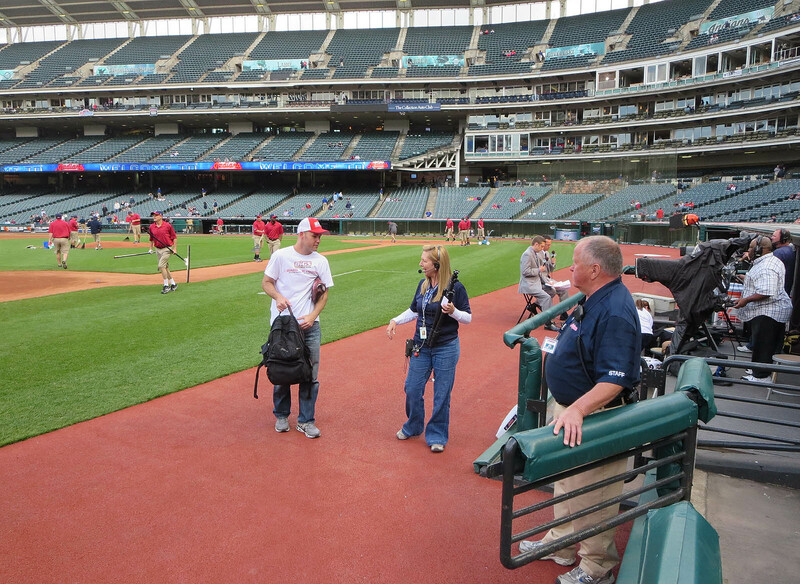 He hasn’t missed a game since the Indians began play at Progressive Field. Pretty sure he was the inspiration for some of the fans in the movie “Major League” too. 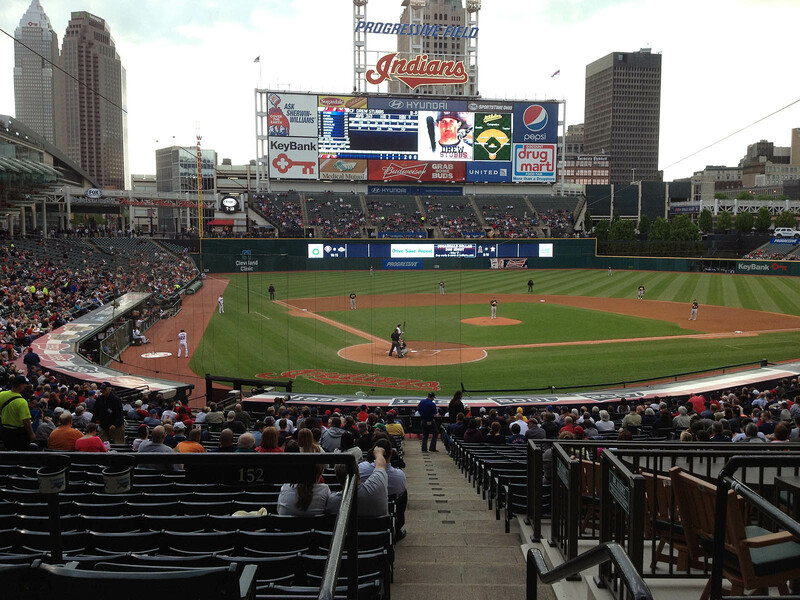 The only thing I didn’t like about Progressive Field is that the bleachers are detached from the rest of the stadium. Yup, I caught up with him when I visited the stadium in 2010.